The International Network for Planning and Improving Quality and Security in Health Systems in Africa (INPIQS) is a non-profit and independent organization founded in 2006. A pool of national and international experts specialized in the evaluation of health systems are working to reform and develop national health policies in sub-Saharan Africa. They aim to harmonize professional practices, develop technical standards of healthcare, and support ministries of health and African universities in the definition of health policies. The rate of healthcare-associated infections in Africa is estimated to be between 35 and 60 percent due to a general lack of prevention and (HAIs) control measures in healthcare facilities. National health authorities often fail to adopt the necessary policies due to a lack of awareness and information regarding the burden of these infections in healthcare settings. A staggering consequence of this is that “HAIs are the third cause of maternal mortality, the second cause of infant mortality and the first cause of post-surgical mortality in Africa,” says Dr Mansour Adéoti, Secretary General of INPIQS. One of the main goals of INPIQS is thus to bridge the gap between health professionals and policy-makers, while building partnerships to improve patient safety. Specific functions of INPIQS include assessing the situation of local healthcare facilities, fostering medical know-how and skills, crafting tailored solutions for specific health systems, promoting south-south cooperation among healthcare institutions and advocating for infection prevention and control policies at the governmental level. 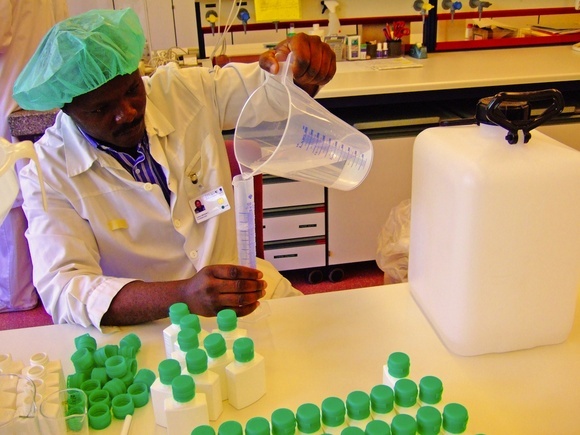 The activities of INPIQS span a large part of sub-Saharan Africa. In 2011, the network oversaw the creation of national policies in Guinea-Bissau and Côte d’Ivoire, respectively on community health and risk management in healthcare settings. In 2012, INPIQS assessed Mali’s strategy for the local production, distribution and use of alcohol-based hand rub solutions. Acting in a consulting capacity, the participants analyzed the cost of producing the solution locally, as well as other economic and political aspects of implementing the plan. Since its creation, INPIQS has built a large network comprising national and regional associations as well as international and regional organizations. International partners include the World Health Organization, the West African Health Organization and the World Bank. According to Mansour, the main achievements of INPIQS have been its collaboration with African health ministries to develop national policies for patient safety, the adoption of an African charter on the quality of healthcare and patient safety and the creation of national and regional platforms to allow patients, researchers and institutional actors to exchange information and knowledge about patient safety. At the same time, there are still many challenges to face. “The mobilization of decision-makers at the governmental level and in healthcare facilities remains insufficient” according to Mansour, and efforts to build capacity are frustrated by the “frequent transfer of qualified, trained staff and senior officials.” Another issue is the lack of funding allocated by states and regional organizations to patient safety and quality care. Future activities of INPIQS include an international conference on blood safety and safety surveillance in Abidjan (Côte d’Ivoire) in October and a joint session between INPIQS and IPCAN (Infection Prevention & Control Africa Network) on the theme "Contribution of Community-Based Interventions in the Fight Against Infection for Achieving the MDGs in the Health Sector in Africa" in November.